A Study in Healthcare Terminology - Part 1 | Language Solutions Inc. In preparation of the new Open Enrollment season, we looked at the state of healthcare terminology for the Hispanic population in more detail. In researching 6 major organizations, both government and private, it can be confirmed that Healthcare Terminology is vastly complex and not always very consistent among different government and private organizations. This is part 1 of our series on Healthcare Terminology for Healthcare Translations. In order to get a sense of the published healthcare terminology standards that exist, we researched the following major organizations to see what healthcare terminology they use in Spanish. Healthcare Translations are one of our main areas of expertise and we wanted to do the research and investment for our clients for healthcare terminology for the Hispanic population. CMS has published over 1,000 English terms with definitions. Strangely, their Spanish glossary is no longer directly linked on their website. However, we were able to find the Spanish site of their glossary with 270 terms in Spanish that seems to have been published back in 2006. CMS also publishes Model Document Templates for all vital plan information that health plans must offer if they cover Medicare. These plan documents are available as templates in English, Spanish and Chinese and need to be followed exactly to be in compliance. Health plans are advised to use these templates each year as a basis for their plan documentation to avoid errors and non-compliance. The Medicare site provides a Glossary in bilingual format English (Spanish) along with a definition in Spanish. The list is not extensive but at least it provides Spanish speaking members a chance to see healthcare terminology for the Hispanic population that they have compiled. The DOL has a PDF of unified terms in English with definitions, as well as a translated PDF in Spanish along with Spanish definitions. These unified terms are references by many organizations, United Healthcare being one of them. 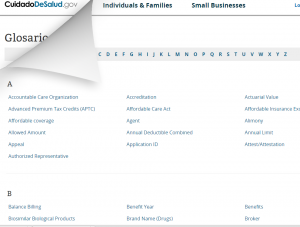 Healthcare.gov provides a lot of information for plan members in both English or Spanish, but each term has its own page and you need to switch between languages each time to find the corresponding term in the other language; a few terms only exist in English and one term was only available in Spanish. Among major private organizations, Anthem has the most extensive glossary available online on their website. AFLAC publishes their English Benefits Guides online but their Spanish Guides were much more difficult to find. Kaiser Permanente only has an immunization glossary. 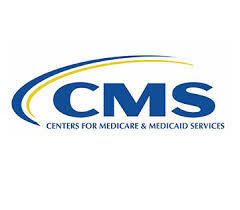 United Healthcare refers back to CMS and the DOL Unified Terms. Aetna once marketed a Spanish site which is not accessible anymore. Continue reading in part 2 where we look more closely how these glossaries affect translation in the healthcare industry. Or read our full study here. Updated September 2016: A new Consumer Segment Study by United Healthcare show that few people have a basic understanding of English terminology! Get ready for the the 2017 Open Enrollment Season and consider translating your materials for Hispanic Employees.